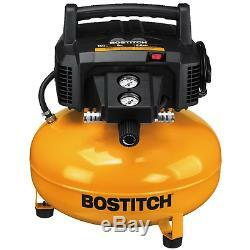 Bostitch BTFP02012 6 Gallon 150 PSI Oil-Free Compressor. 150 max PSI 6.0 gallon tank and 2.6 SCFM delivered at 90 PSI pump. Long life oil free, maintenance free pump (hose not included). 78.5 dBA operational noise level for a quiet work environment. Bostitch high flow regulator and couplers to maximize air tool performance. 29 lb weight and narrow tank diameter make unit easy to carry/store. The item "Bostitch BTFP02012 6 Gallon 150 PSI Oil-Free Compressor" is in sale since Sunday, February 12, 2017. This item is in the category "Home & Garden\Tools & Workshop Equipment\Air Tools\Air Compressors". The seller is "goodsbydanny99" and is located in United States. This item can be shipped to United States.